In Bangkok location is everything! 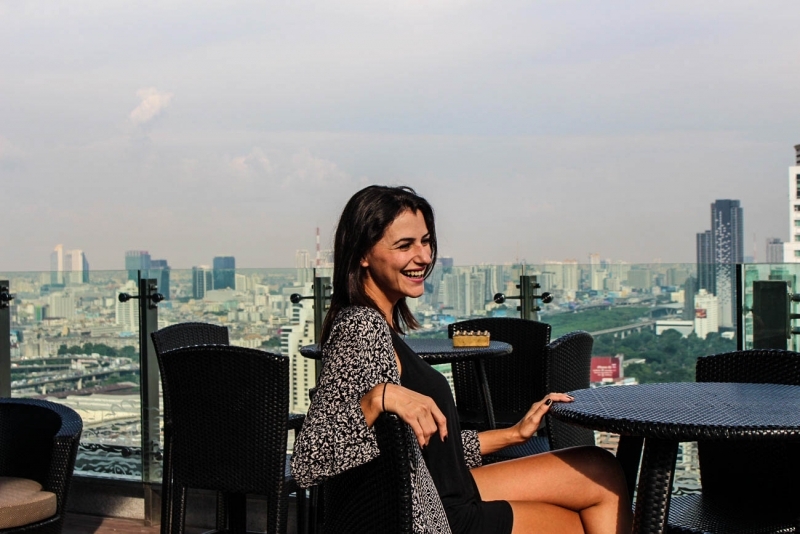 Thailand´s capital is huge, busy and intense, to enjoy the city you need a comfortable place in the right spot. For us Amari Watergate was the perfect choice, in the heart of Bangkok it has luxury service at affordable prices. For a weekend getaway, business trip or honeymoon, Amari Watergate Hotel is able to deliver exclusive services, luxury treats for many types of travellers. You can find all the amenities and services you expect from a 5 stars hotel plus an impeccable service. That’s what really surprised us, most of the big hotels [and big hotel chains] are very comfy and nicely decorated, but sometimes they lack the human touch, however we never felt this in Amari Watergate Bangkok. You can choose between two range of rooms and services. The traditional Deluxe room that follows all the 5 star standards and for sure you will have a pleasant stay. But if you pick one of the rooms on the Executive range, then my friend, you will be pampered and treated with delicious food, cold drinks and beautiful smiles. We stayed at the Executive Suite and got access to the premium service of Executive Club, which means your room will be on the top floors of the building [stunning views], separated reception [quick check-in and check-out]. An executive lounge with complimentary breakfast, juice, coffee and tea during the day, and happy hour with cocktails and finger food around sunset time! Amari Watergate Bangkok has 5 types of rooms all them very clean, well decorated, spacious, bright and with amazing comfortable bed [if you have travelled around Thailand, you probably have noticed that most of the hotels´ beds are hard, I don’t know why??!]. The bed at Amari Watergate was heaven, not too soft, not too hard, with different sizes of pillow and smooth blanket. The Corner Suite is bigger than the other rooms [Deluxe and Executive Suites] and have windows facing two sides of Bangkok. The Presidential Suite is like an apartment, big and beautiful. We visited the room when the staff was preparing the bath tub, flowers and the champagne for a honeymoon couple. Have to the honest with you, I felt a bit jealous, the suite was beautifully decorated for them. We wish them long-lasting love!!! As we already mentioned, if you stay at the Executive rooms you have access to some privileges. Services that will make your stay more luxurious without costing too much. If you are a member of the Executive Club or staying in the Executive Rooms you can arrive at the hotel and go straight to the 32nd floor to do your check-in in the private reception, while they check your passport, you will be welcomed with cold towels, drinks and an incredible view of Bangkok. The Executive Lounge is where you can relax, work, enjoy a cup of tea or refreshing juice during the day. As from 5pm the cocktails, wine and delicious food are served for the guests, a perfect pre-dinner or pre party. I´m sure you will not get tired of watch the sunset from the big windows, even the thunderstorms look pretty from there. Apart from the Executive area, all the other facilities at Amari Watergate are available for all the guests. The swimming pool, the gym and the sauna are great. Band new equipments and super clean. As sport enthusiasts we manage to wake up early and go for some work out and swimming. If you want to forget about the world and deeply relax, the Spa Breeze is your best option. With signature treatments the spa offers invigorating services. Remember to book in advance, the Spa is almost of the time fully booked. You can also treat yourself with amazing food and wine. At Amari Watergate you find 3 restaurants: Cascade, Promenade and Thai on 4, serving luxurious Thai food, western dishes and unique recipes. Amari Watergate is in the heart to Bangkok. In the middle of the shopping area, close to the biggest malls. From top designers to fake Loui Vuitton bags, you can find it all around the hotel. Restaurants, bars, street food and cinema. You can´t be more central than this. The BTS [Skytrain] line is a two blocks away from the hotel, taxis, moto-taxis and tuk tuks are available 24 hours, and if you like to walk, feel free and safe to explore the streets around. Bangkok is a huge city, busy, but still safe. Of course you need to look after yourself while roaming around town, however we walked the streets near Amari Watergate late at night and didn’t have a problem, neither felt unsafe. The hotel is easily reached from all the airports. From the Suvarnabhumi International Airport you can get the airport link train, exchange to the BTS line and stop close by the hotel. From Don Muang, the small local airport, you will need a taxi to the hotel or ask the driver to drop you by Chatuchak BTS station, from there you can take the skytrain to Siam or Ratchathewi station [both are the closest to Amari Watergate]. Oh yes, it is very [super] comfortable! We can´get enough of saying that they have one of the best beds of our whole trip [almost two years on the road]. The furniture, the facilities, the common areas, everything here was thought and organized to make the guest feel relaxed and welcomed. Extra points for the girls on the reception and at the executive lounge bar, always ready to help you. As much as I love Bangkok, I didn’t want to leave the hotel. The food at the Amari Watergate restaurants were delicious, the breakfast a truly feast [from French pastries to Asian and Indian buffet]. Unless you want to try something new or trendy in the city, there is no need to leave the building. For the Executive rooms you also have access a private reception, happy hour food and drinks, and a special breakfast served at the lounge on 32nd floor. Definitely Amari Watergate Bangkok is a great value for money. You get 5 star rooms, comfortable property, incredible amenities and great service for an affordable price. What you pay for a room in Amari Watergate Hotel is really worthy. Affordable luxury. You can check all the details, rates and book your room at Amari Watergate Bangkok on their official website. Or if you still want to compare prices, location and reviews you can go to Agoda or Booking.com [we use these two websites to book our own accommodation, so you can trust and use them]. Choose a hotel in Bangkok can be an overwhelming task, so many offers, so different areas, prices, styles. Feel free to browse around, but if you are looking for a comfortable place, 5 stars services and good price, come back here to book your room through our Blog. Planning your trip to Bangkok? Great!!! The city is plenty of amazing attractions, cultural activities and delicious food! Our special post about Bangkok is still under construction and soon we´ll have many tips and information to share with you. Also think about visiting Chiang Mai in the north of Thailand, the city is famous for its temples, lush green mountains. 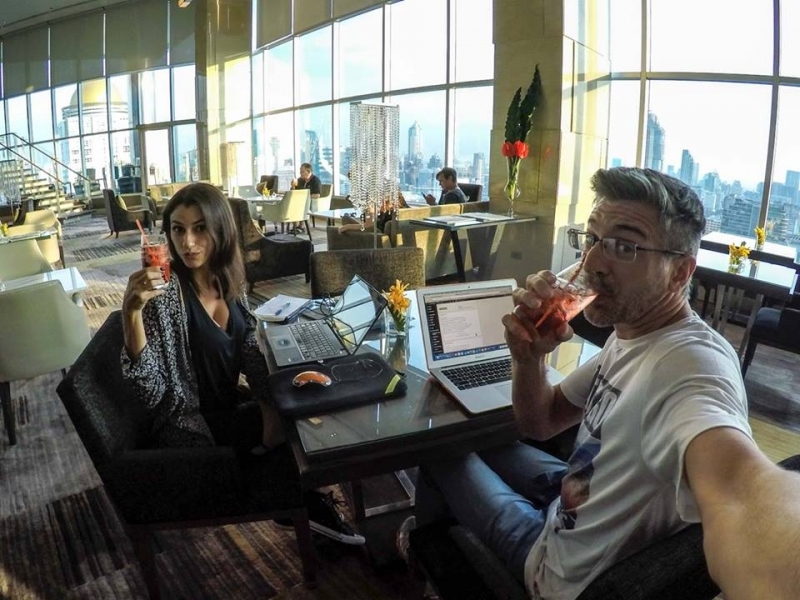 It´s one of the best place for digital entrepreneurs and long-term traveller. Have you decided where you are going to stay in Bangkok? Do you like Amari Watergate Hotel? Leave your thoughts and doubts! Ps. Our nights at Amari Watergate Bangkok were a courtesy. Doesn’t matter who paid the bill, you always get our honest opinion. Adding to my dream list of places to visit. Wonderful article, Thailand is so big but you managed to hit a lot of great places, and lots of things to see and do. Ironman Malaysia » Langkawi is stunning and tough!